Looking Over the Overlook Trail: Leonard Harrison State Park, Tioga County, Pa. The Pine Creek Gorge, seen from the Otter View platform on the Overlook Trail. Well, trail heads, rumor has it that it is officially fall. And considering the sudden plunge in temps that has necessitated getting my turquoise down jacket out of storage, I believe it. So at this time of year, the blog should be talking about things like fall foliage hikes, winter gear and what the heck is up with that whole pumpkin spice thing. And I’ll get to that, I promise. But I’m going to give you a last little taste of summer with another feature from last August’s Pennsylvania park hop. In between Cherry Springs and Darling Run, biking, stargazing and the occasional bear sighting, we paid a quick visit to Leonard Harrison State Park, near Wellsboro in Tioga County. This park, part of the Tioga State Forest, has a handful of hiking trails – the Pine Creek Rail Trail down at the bottom of the gorge, the steep and winding Turkey Path trail, and the Overlook Trail (which is the one we hiked). But the reason that most people come is the view – and what a view it is. The park was once one of several lumbering areas that once existed along the top of Pine Creek Gorge; the logs would be sent down a log slide to Pine Creek, where they would be picked up by wagons (and later, trains). The hardwood forests were very desirable to lumber companies, but all that lumbering eventually took a toll. The area has been designated as a “National Natural Landmark” since the 1960s. Harrison had been a prominent businessman in the area in the late nineteenth century, including in the lumber business. Eventually, as the history section on the park site explains, he bought 121 acres atop Pine Creek Gorge and turned them into a picnic area and sightseeing spot for tourists, eventually handing the land over to the state in 1922. 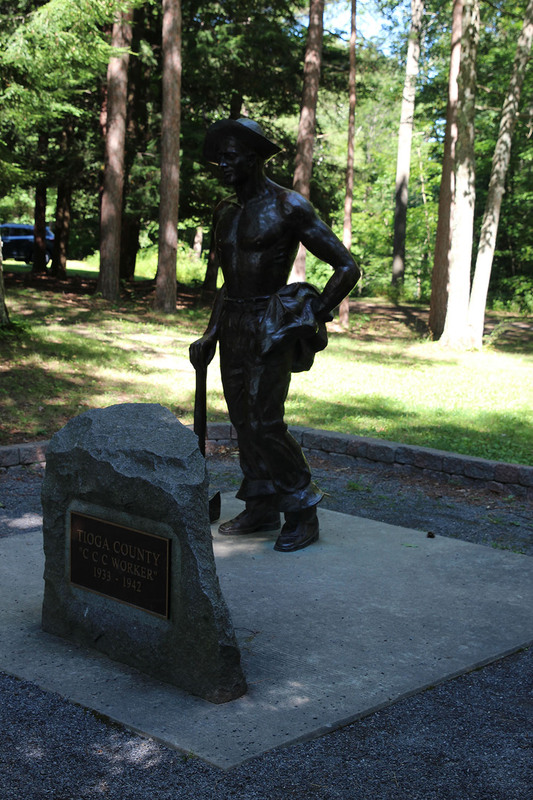 In Leonard Harrison State Park is a statue of a Civilian Conservation Corps worker, in tribute to the crews that worked in Tioga County during the Great Depression. The Civilian Conservation Corps had a camp near Darling Run during the Great Depression, and the CCC crews helped to develop and maintain the parklands during that time. Along the Overlook Trail, you’ll find a giant concrete incinerator that crews once used for burning trash and debris. There’s a statue in the park dedicated to the workers today. Watched a few turkey vultures riding the thermals over the gorge, and then took on the Overlook Trail. 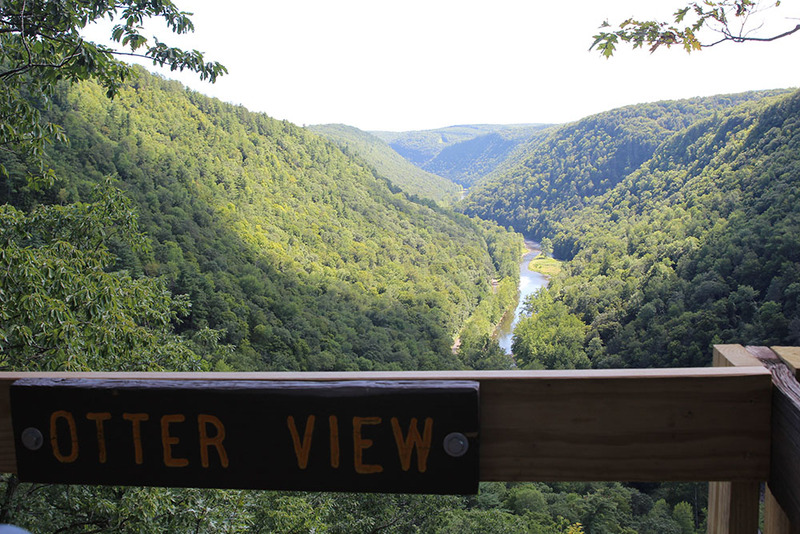 The Overlook Trail takes you down to Otter View, a little overlook platform with very awesome views of the Pine Creek Gorge. It’s relatively short (just over half a mile, give or take), but it’s a bit on the steep side. But the views are so, so worth it. When we were there, it appeared that the platform had been very recently rebuilt – the wood was not yet weathered. For a future pass, we’ll make time for the Turkey Path trail and the waterfalls – stay tuned!